Remember: all of my pictures are clickable for huge! 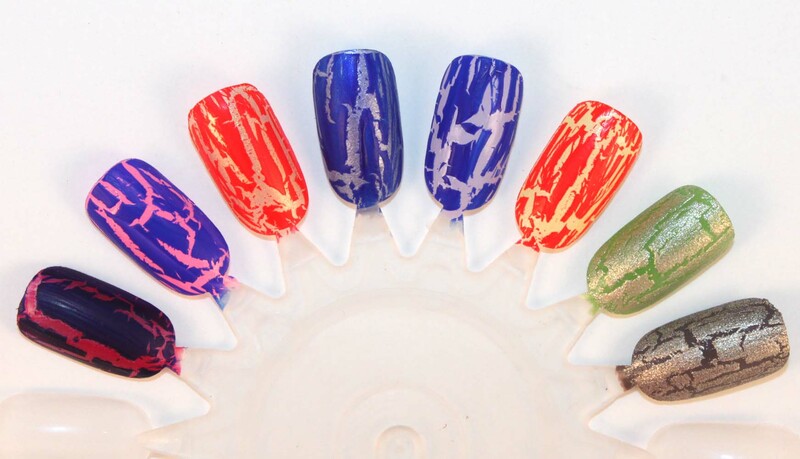 Blogsale time…over 300 polishes available! 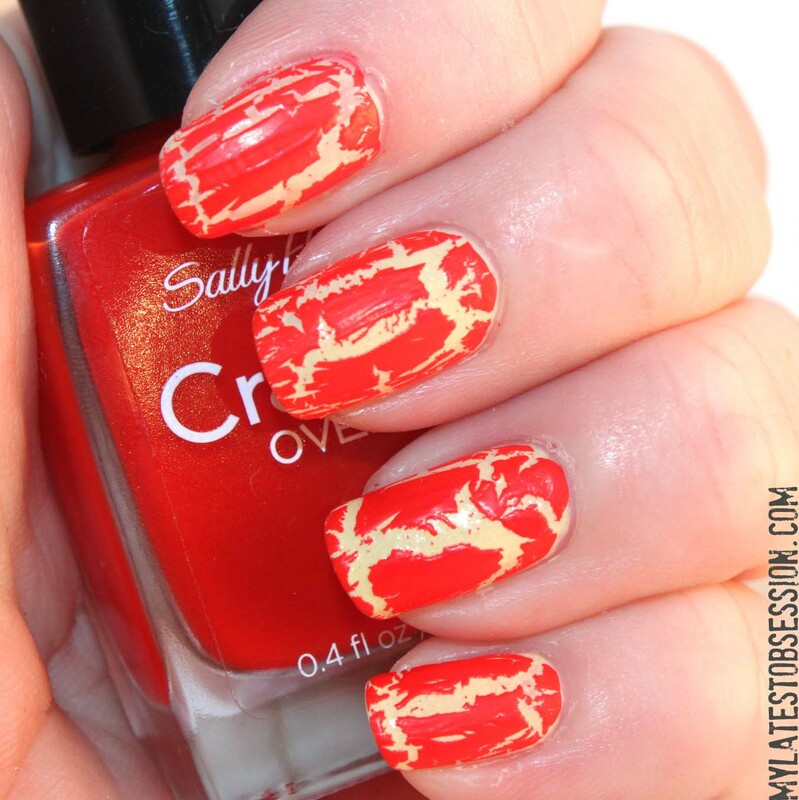 I went into CVS the other day with The Cute Boyfriend to pick up my 6 Revlons for that Extra Bucks deal they were having, and there was a pristine, completely full display of the new Sally Hansen crackles! I was all excited. Of course, TCB’s opinion was “well maybe other people don’t like crackle as much as you do!” I told him to shut up. Of course, I went into another CVS a few days later and saw another entirely full display, so maybe he was right, I guess. BTW, they had that Essie collection with Coat Azure for 50% off. I bought Coat Azure, and it rang up at $2.99, which is actually something like 6.25 percent off though, so, weird. 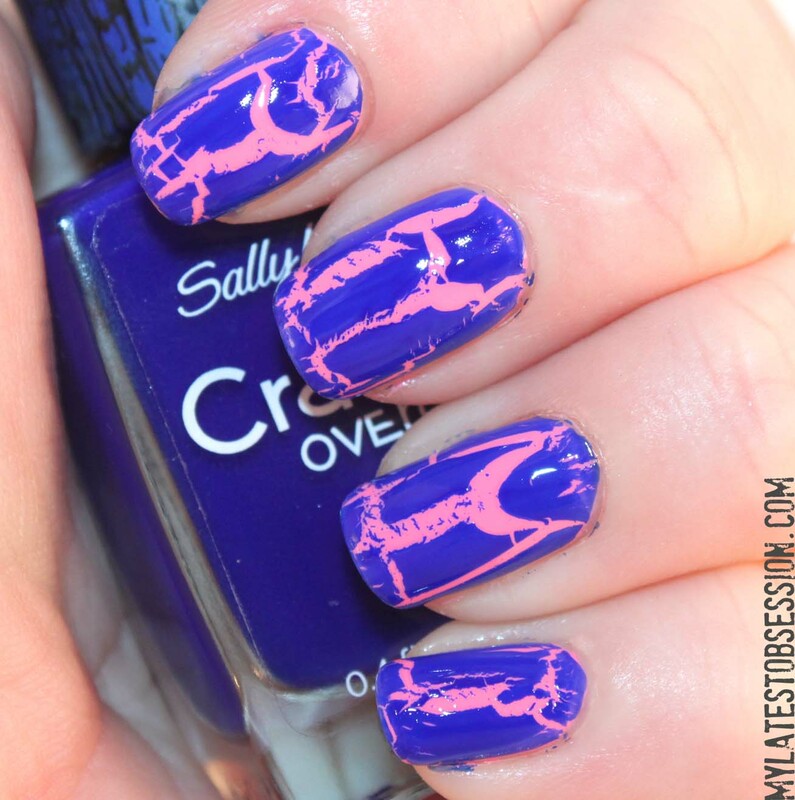 So I am getting a little bit bored with the selection of crackle colors available currently. Black, white, silver, pink, shimmery purple. The gold one in this collection is the only one that seems really “new,” and the other two colors available are red and blue. Anyway, so I passed most of them up (OMG, $7.49???) and picked up the red, blue, and gold ones. These seem pretty thick to me, I thinned them out AFTER most of the following pics were taken, and they seem to be working a lot better now, but they still crackle much differently than the OPIs and China Glazes – they make big wide cracks instead of tiny ones, and also they’re not straight cracks – they’re sort of jagged and wavy. I like bold cracks though, so I’m cool with that. Oh, and one more thing to add to this already long ramble of mine – the caps on these bottles have a plastic sleeve on them that’s printed with a crackle pattern. It’s totally cute, but I took mine off because the sleeve doesn’t allow the caps to turn very well. And JUST ONE MORE THING: the brushes on these are tiny and make them slightly hard to apply. Distressed Denim – this is shown below over a no-name Cosmetic Arts polish, and because it’s slightly translucent, it shows up purpleish. It doesn’t work well over darker colors because it ends up looking muddy. Cherry Smash – bright bright orangey red, and this one is also translucent. 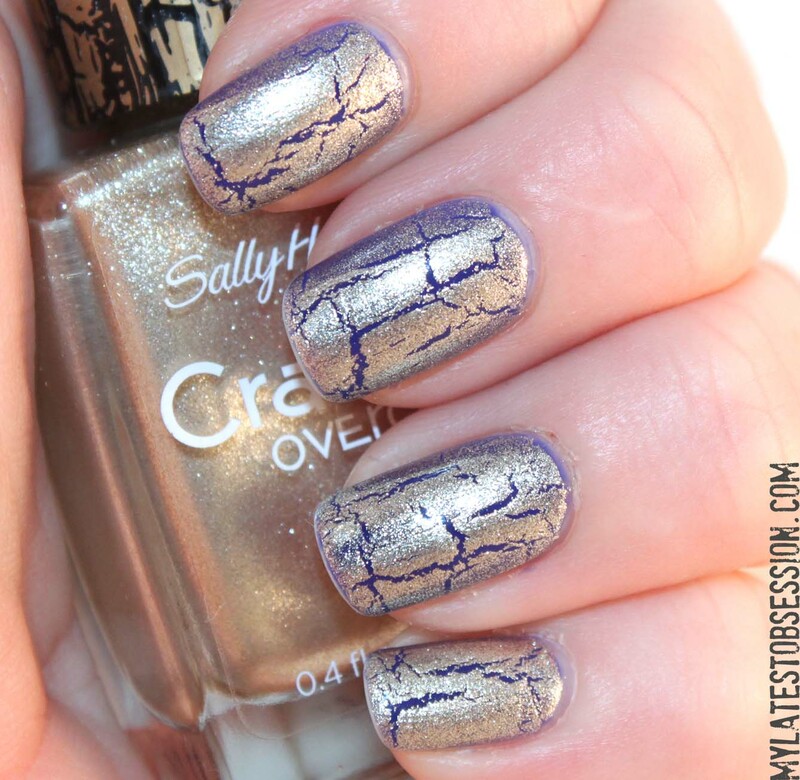 A neat thing about this one is that when applied over a shimmer, the crackle polish ends up looking shimmery. Antiqued Gold – My favorite! This is a very soft gold, not very yellowish. The shimmer particles are a lot smaller than the ones in OPI’s Silver Shatter, so it gives sort of a distressed, aged look which I like a lot. The OPI’s too sparkly for me. This gave me the smallest cracks, probably because it wasn’t nearly as thick as the other two. And here are some other combinations I did while I was trying to decide which colors to use…the one on the far left is Distressed Denim over Zoya Roxy – see what I mean about it not really working over darker colors? 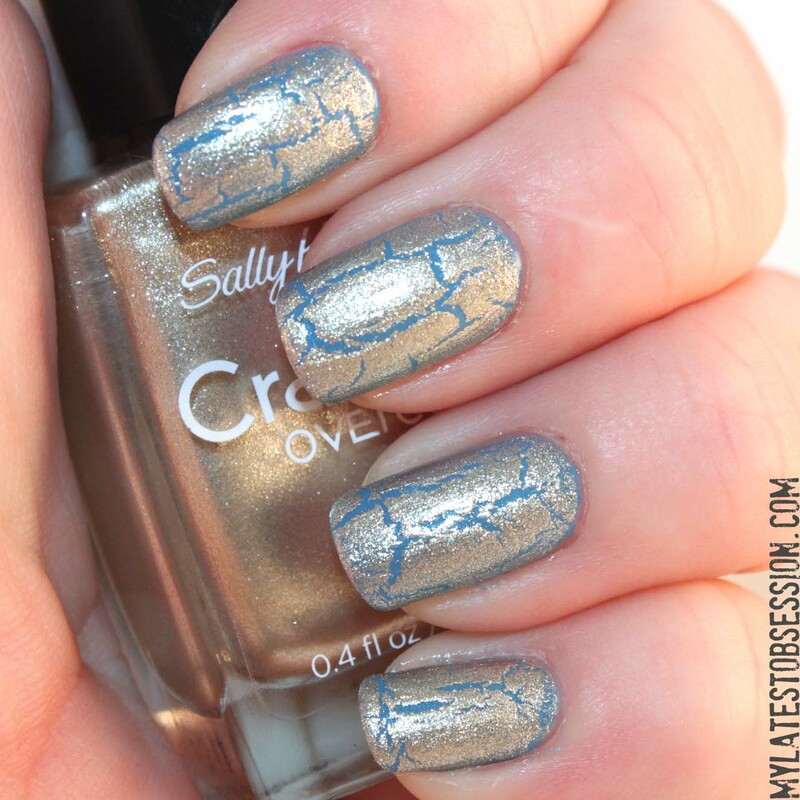 Silver over Coat Azure may be the only time I’ve seen a silver crackle that I liked! I love the swatches. At walgreens when the these crackles polishes came out. It didn’t even last a day. Good thing I had asked the cosmetic department to hold mine. I got them all except for white which by the way I am regretting. wow, that’s so weird, since I’ve seen them at like every store I go to around here for months! I love the first color combo ! Enter your email address to receive updates in your email!